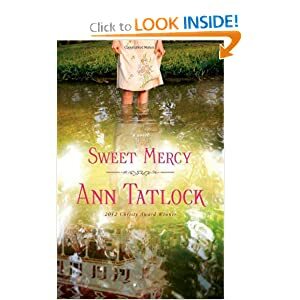 Sweet Mercy is a wonderful example of Christian fiction at its best. It takes an issue--good people doing bad things-and explores it within a novel with characters who have real feelings and make decision in the imperfect manner most of us do. From remembering that Al Capone helped her up when she fell roller skating, to learning that her first love is involved in bootlegging, to realizing that bootleggers wouldn't bootleg without customers, Eve has to examine right and wrong and realize that all of us can be the man in the front of the synagogue, and that all of us should be the person at the back begging for mercy. Right and wrong are so easy to see when they are committed by strangers; when it is us or those we love, our vision is often blurry. Often when Christian fiction has Catholic characters they either make them almost Evangelical Protestants or else make them into pitiable folks who just don't get it. I'm happy to say that Ann Tatlock does neither in this book. Another character gives Eve a St. Rita medal and tells her that St. Rita is the patron saint of the lonely. He explains patron saints rather well. A Catholic funeral is also described and while I don't know enough about Catholic funerals of that era to know if the details (which were few) were all right, the overall tone was respectful. I'm not usually one to rave about the writing in a book, but this will be one of the exceptions. I loved Tatlock's writing and would find myself reading bits out loud because I loved the way they sounded. Yes, this one gets one of the few A's I give books. I definitely recommend it. Thanks to the publisher for providing a review copy. I always love rated A books. Wow! That carries a lot of weight; the description of the book didn't catch my attention, but your review does. Thanks!